With the numerous baseball fans at R&R, employees share their favorite baseball memories. 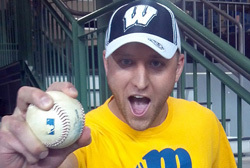 Knowledgebroker Chris Kopp loves the Milwaukee Brewers and was featured in an OnMilwaukee article because of his lucky catch. He was attending the Brewer’s game on June 6th in which Taylor Green was rounding the bases for his first Major League home run. He was in just the right place in Miller Park because the home-run ball came so fast at Kopp he didn’t have time to react. So what happens when you catch such a momentous ball? The key is getting the ball back to the player before it gets lost or stolen. Usually, the player likes to have the ball back as a keepsake so stadium staff needs to locate the fan and start negotiations. Kopp’s attitude had an effect on all parties involved and we are proud to have him as a knowledgebroker. To congratulate him on this once-in-a-lifetime experience, contact Chris Kopp.